Over at The Quivering Pen blog, David Abrams has published his extensive and knowledgeable Great Big Roundup of 2014 Short Story Collections, as well as an addendum to that list, which together cite more than sixty short story collections. And Abrams has something interesting to say about each one of them. Even more short story collections have been or will be published in 2014—probably well over a hundred altogether. And you'll see posts on this blog from authors whose books we will be considering for The Story Prize throughout the year. Please, please, please don't say that the short story is enjoying a renaissance or anything along those lines. It isn't. This is consistent with the output I've seen over ten years of reading story collections for The Story Prize. Just because someone is only noticing it now doesn't mean it's only happening now. The short story comeback piece is one of two no one should ever write again, in my opinion. Nor should it be the preamble to a review by a reviewer who clearly hasn't been keeping up. The other piece that I hope to never see again is the one on the death of the short story. It hasn't happened, and isn't going to happen, because writers will always be interested in exploring the many artistic and storytelling possibilities inherent in the form. Period. Established writers will continue to write stories or return to them. And emerging writers will start out writing them—and in many cases will continue to do so throughout their careers. Two other angles that are equally dubious are taking potshots at MFA programs and bemoaning what someone might perceive to be a dominant style (past or present). Writing students aren't tabla rosas subject to the imposition of a particular style or approach. Most have already established their own approaches and are in a studio program to gain time to write and to hone their skills. And no one style has predominated in the past hundred years or more, despite perception. Examples to the contrary abound. The big publishers have done a very good job of supporting short fiction. I speak to agents and editors who truly have a passion for short fiction. But the support commercial publishers can offer to short story collections does have practical limits. While some story collections have made the best-seller lists (Junot Diaz, George Saunders, and Lorrie Moore, to name a few), most won't break into the black. Commercial publishers are supporting the form because they are supporting authors they are committed to and because they know it's smart to get in on the ground floor of potentially great writing careers. What has been a particular boon to the form has been the support of both established independent publishers and small presses, old and new, which together help publish and promote a great many other deserving books each year. Whether you like short fiction or not (another tired reviewing approach is the "I generally don't like short story collections but I like this book" approach), it's not going anywhere. Anyone who follows the form knows this, and anyone who doesn't should inform him or herself before resorting to sweeping generalizations and tired observations about the so-called state of short fiction. The story is bigger than any of us. In the sixth in a series of posts on 2014 books entered for The Story Prize, Molly Antopol, author of The UnAmericans (W.W. Norton) discusses her writing habits and how her family history has inspired her. I write on days I don’t teach, and always at home—because I love having my dog at my feet while I work, and she’s not allowed in coffee shops or libraries. I get my best work done in the mornings, before the day fills up with obligations, and I don’t have any particular rituals aside from coffee—no magic pen or lucky hat or anything like that. The only rule is to turn off the phone and block the Internet—I have a terrible addiction to the Internet, and I’ll go off to research one tiny detail and three hours later come up for air having read ten articles about something totally unrelated to my book, like the history of pasta. So I keep the Internet turned off and, as I write, I make a list of all the things I need to look up when I’m finished working. It becomes a kind of treat to go through the list when I’m done. Then I go on a run. I find that when I make myself focus on one specific problem I’m struggling with in my story when I’m running, I’m able to untangle things much more easily. Though I probably look insane, jogging through the streets, talking to myself. I’m not sure I’m at a place yet in my writing career to offer up advice, but I do often tell my students that once writing became central to my life, it was really important to embrace the solitude that came along with it. Even when things are incredibly hard, I find comfort sitting alone in a room, trying to shape a narrative that makes sense of—and sometimes even controls—the most painful parts of life. My family. My relatives are among the best storytellers I know, and as a kid, I always knew that when it was my turn to talk at the dinner table, I’d better have something interesting to say. I grew up hearing my family’s stories, many of them about their involvement in the communist party. I heard so many tales of tapped lines and dinnertime visits from the FBI, and many of the stories in my collection grew out of my desire to understand what it might have been like for my mother and her siblings to have grown up under such intense surveillance, knowing that their most intimate moments were being recorded and catalogued. My story collection took me ten years to write, and during the first year, two things happened that helped shape the book. The first had to do with Antopol, the Belarusian village my relatives came from, which was virtually destroyed during World War II. 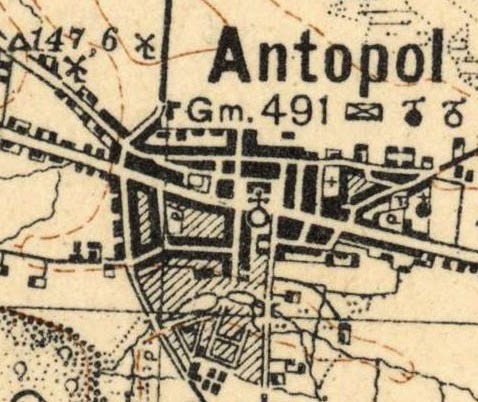 My family could find humor in even the darkest parts of their history, but Antopol was a topic no one went near. I was living in Israel then and wound up at a party in Haifa, where I met a woman from Antopol who remembered my family. It was incredible, sitting in the kitchen and hearing stories about relatives I’d known so little about that they’d always seemed almost mythical to me. At the end of the night, the woman told me about an oral history book of the village, an enormous tome written in Yiddish, Hebrew, and English. It was right when I finished reading it that I began working on my collection. The second thing that happened that year was that my family gained access to my grandfather’s FBI files. I didn’t know him well—sadly, he died when I was a kid. The reports followed him across the years and across the country, starting in the 1930s, when he first joined the Party in New York and began organizing at a cardboard box factory. In the files, I was able to see exactly what the FBI was looking for, but nothing else. They showed nothing of what being watched does to a person psychologically and emotionally. They showed nothing of the devastating impacts that one person’s efforts to improve the world can have on the people closest to them. And they showed nothing of the pain that led my grandfather to leave the Party, and how heartbreaking it was for him to learn of Khrushchev’s revelations about Stalin—for him to realize that the movement he’d dedicated his life to was so flawed and corrupt. Since the files left all this out, I found myself addressing these questions in my stories instead.